There are some people whose lives are nothing without photography. Whenever they get a chance to capture a photo, they don’t miss it. To be precise, they are highly passionate about photography. If you think you are one of those people, then this ultimate guide is for you. 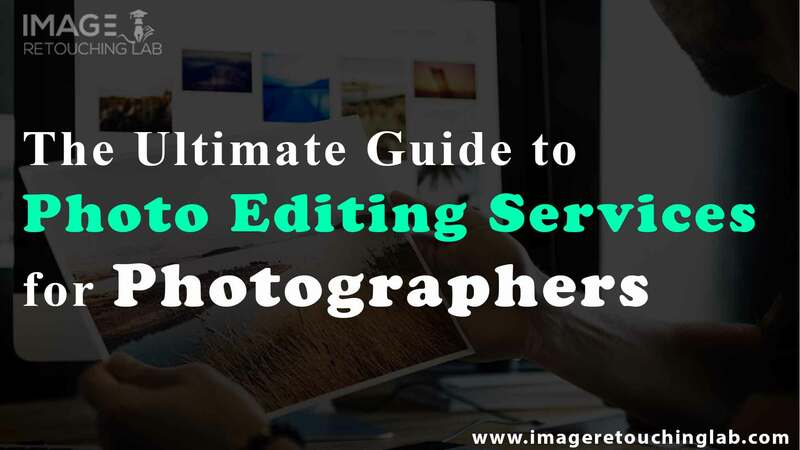 The guide talks about photo editing services for photographers step by step. Photo Editing is a term that means the act of altering an image. When you capture a photo, it is just the beginning of photography. The most important part of photography comes after capturing the photo. Here comes the role of photo editing. Having edited a photo, we usually get a perfect look of it. But an unedited photo looks clumsy when we have our first look at it. In fact, an unedited photo can hardly attract viewers. Editing specialists have keen eyes on photo editing. Like your passion for photography, they are also passionate about editing. And this makes them experts in the field of photo editing. You must believe that experts always do the greatest jobs around the world. So, you can easily rely on them. As a professional photographer, you might have dozens of projects to handle. If you can’t deliver your service on time, then it may damage your career. But some photographers have to undergo some hassles since they take the biggest job of editing as well. Generally, photo editing is a time-consuming task. So, it may kill your valuable time of photoshoots. That is why you should assign your raw photos to someone who is an expert in the field of editing. It will help you maintain your workflow. We are always busy with our businesses. It keeps us away from our near and dear ones. Don’t you think that you should spend some time with your beloved ones? Never let you run out of your emotions and feelings. Keep a portion of your time for your family. It will make both you and your family happy. But how can you spend time with your family while you have to handle a lot of projects? That is where you need a photo processing service. So, grab a professional photo editing service and save some time for your family members. Turnaround time is noteworthy while dealing with your clients. The faster you can deliver their images, the happier your clients will be. But how can you deliver faster when you take the responsibility of editing? You must remember: if you continue doing the job of editing along with capturing photos on different programs, you will possibly face missed deadlines and broken promises in the long run. That is why you should look for photo editing services for photographers. Nobody wants to keep his business standstill. Even you might cherish a dream to extend your business. According to many small business owners, their businesses don’t grow because they don’t pay their attention to their business growth. It is clear that if you want to grow your business, you must pay attention to this issue. But you cannot pay your attention to your business growth unless you put aside the editing tasks of your photos. So, you need to hire a professional photo editor if you want to get your potential business growth. Networking is one of the most potent ways to get consistent projects for any business. The stronger networks you have, the better clients you get. And to make your network strong, you have to spend sufficient time on networking. For this reason, you need to save some time from your daily work. Doing the job of editing along with capturing photos, you will find it difficult to extend your business network. That’s why you should buy an editing service from a professional editor. We, human beings, feel stressed when we do something out of our passion. You might have a passion for capturing photos, but editing is something you do to save some pennies. As editing is not your passion, you might get stressed while editing a photo. To get out of your stress, you should keep your editing tasks aside for a professional editor. In this way, you can get relaxed from your stress and spend more time on your main Job—which is capturing photos on different occasions. It is difficult to judge your work. You might be biased while checking out your edited photos. But when you hire a professional editor, they will poignantly look into your raw photos. By checking your photos, they can suggest you some innovative ways to improve your photography. At the time of choosing a photo editing service, you must consider how good the company is in communication. You should remember that a professional company is never inactive in communication. Good companies are always ready to listen to whatever their clients ask them. If you have to wait for your reply after asking a query to a photo editing company, then you have to realize that the company does not have professionalism. Following deadlines strictly helps any company to keep up the reputation. And no company in the world wants to lose reputation. But those who are not professional lose their reputation within a short period. A professional company, which wants to provide excellent services, never compromise with deadlines. So, if you want to find out a good photo editing service provider, pick up a company to order your first project. You should test them with a small project. If they can provide you with the best service within deadlines, then you can consider the company for your upcoming big projects. When you get your project completed from your service provider, you might not be satisfied with it. And you might want your photos to be slightly edited again for perfection. In such a case, you have to send your project again to the provider. This is where you can identify a good editing company. A professional company in the field of photo editing is always helpful about revisions. You will find numerous newborn photo editing services prevailing on the internet. If you have chosen any service from them, you may face this kind of problems. There are some companies which demand extra payments when you want some revisions from them. Even you may find them demanding extra payment without further revisions. It sounds pretty silly. So, try to avoid these companies at the time of picking one for your projects. A good agency is always determined to provide excellently edited photos. But there are some companies which do not pay profound attention to the quality of their photo editing. When you send your photos for editions, they cannot give it back with the proper edition. As a result, you must lose your hope for working with them for your upcoming projects. So, before working with an editing agency for your big projects, test some of the agencies by assigning a few small projects. Two options will pop up in your mind while choosing a photo editing service. You can either go for an online service or an in-house service. You might be in confusion about which option to choose. That’s why we have come up with the pros and cons of both online and in-house services. Image Retouching Lab comes up with a great website. And the homepage of the site is very clean and crisp. You will find almost everything on the website whenever you browse on it. In fact, their website has the capabilities to quench the thirst of every service taker. They have decorated their website with a great range of examples—which pave the way for us to trust their quality. On their website, they have an informative blog where they post on various topics. If you want, you can benefit yourself from the blog. The company charges different prices for their various services. For instance, they charge $0.29 to $4.99 for Clipping Path Service, while their Image Retouching Service costs their clients $0.49 to $6.99. In general, the range of their service charge is $0.29 to $20.99. The website of the company is jam-packed with a lot of information. You will find almost everything on the site, which you may want to check as a service taker. They offer various services to their clients. In fact, they are providing all types of photo editing services—from portrait retouching to real estate editing. You will see a great number of high-quality retouching examples on the website of the company whenever you peep up. They have an excellent blog on their website. On that particular blog, you will find much necessary information. They discuss different topics on the blog regularly. The company has four pricing plans for their clients. Basic, Pro, High End, and Extra are the pricing plans for their services. Generally, they charge $2 to $10 for different types of services. The agency has nicely decorated their website with a varied range of features. One can easily find out the necessary information from the site. And any visitor will fall in love with the high-quality and stylish design of the homepage after having the first glance at it. Wedding Retouching offers its clients miscellaneous services regarding photo editing. The services are as follows: Color Correction, Portrait Retouching, Body Retouching, Background Removal, B&W Editing, Family Editing, Photo Montage, Post Processing. If you want to check their previous works, you will be glad to see great examples of their previously completed projects on the portfolio section of the site. They are running an informative blog along with their main site. The blog has sufficient information on multifarious topics. But the frustrating thing is that they are yet to publish a new blog post in 2019. The company offers five kinds of pricing plans for their clients. The pricing plans are Culling, Color Correction, Simple Edit, Pro Edit, and Advanced Edit. The charge of the plans varies from $0.05 to $10. We Edit has a nice, crisp, and simple site to provide the clients with whatever they want in the field of photo editing. As a client, you have much to get from the site. To your necessary information, land on their homepage and check it out. Their services usually include Portrait Photo Editing, Wedding Photo Editing, Color Correction Services, Glamour Retouching, Retouching Services, Beauty Retouching, Background Removal, Photo Correction, Photo Enhancement, Photo Post Processing, Photo Post Production, and Photo Culling. Considering buyers expectation, We Edit has compiled its site with multifarious examples of previous works. And those examples help any client to decide to choose a service from them. They have a blog attached to their main site. You can find necessary information from the blog without facing any difficulty though they do not post regularly on the blog. The company has four pricing plans for their clients. Four distinct plans charge their clients with different prices. In general, you have to spend $0.20 to $5 per image. The website of the agency has an ordinary design. If you have special feelings for simply beautiful things, then the design of the site will attract you at your very first glance. High-End Beauty Retouching offers diverse services to its clients. Their services, however, include Glamour Photo Editing, Fashion Retouching Service, Magazine Retouching, Advertising Retouching, Model Photo Retouching, High-End Portrait Retouching, Skin Retouching, Photoshop Hair Retouching, Dramatic Photo Editing, and Post Processing HDR. The company has a collection of their previously completed projects. And their portfolio images show us how good they are in photo editing. In a particular segment of their website, there is a beautifully designed blog. From the blog, you can benefit yourself by taking necessary information although they don’t update their blog regularly. High-End Beauty Retouching comes up with four distinct pricing categories. The categories include High-End, Ultra High-End, Magazine, and Ultra Magazine. To choose any of the categories for your upcoming project, you have to spend $10 to $150 per picture. Retouche has a website which may not look professional. The site has a very simple and clumsy layout. But you will find almost everything you expect from the website. Their services are primarily divided into four categories, and each category has some sub-categories. The main categories are Portrait Retouching, Product & AD Retouching, Photo Restoration, and Photo Montage & College. The company has decorated its site with a good number of example works. Check out sub-categories to see the example works. They have placed the examples at the bottom of each sub-category. At present, Retouche does not have any blog. But there is a possibility that they will soon launch a blog to help their clients. Having a responsive website, Image Salon has attracted a lot of clients all over the world. The homepage of the site has a gorgeous look indeed. We did not find any clear direction to their services. But many of their clients have reported that The Image Salon provides a variety of services. They have a great number of example works on their website to attract new clients from all over the world. Image Salon has a particular blog to help their clients on miscellaneous topics. But it is a little bit difficult to read the articles of the blog as the background of the pages is black. The company has four different pricing plans for their clients. The plans include Express, Basic, Basic Plus, and Portfolio. In general, you have to spend $0.27 to $7 to get an image edited by them. To conclude, photo editing services for photographers are essential to maintaining continuous workflow. And continuous workflow will help you build a strong position for your company. We recommend you to choose an online service provider for this purpose. As we have listed the top seven companies in the field of photo editing, you won’t have to undergo hassles to find out a good photo editing company. To be more specific, our recommendation is to choose either Image Retouching Lab or Fix The Photo.